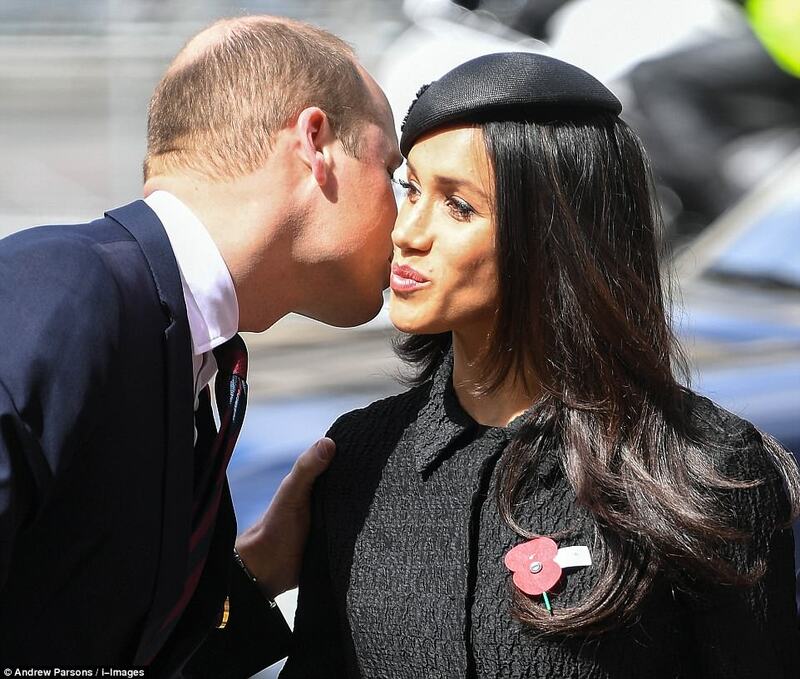 Prince William shared a kiss with Meghan Markle as they arrived at Westminster Abbey for a traditional Anzac Day service this afternoon. 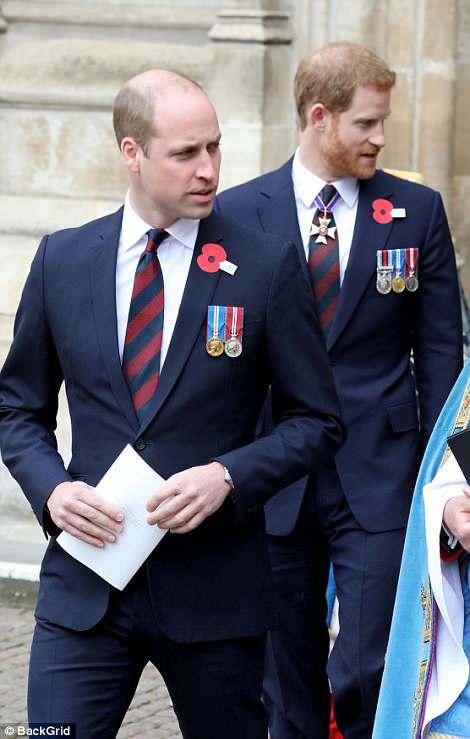 The father-of-three has returned to royal duties for the first time since his wife the Duchess of Cambridge gave birth to their third child on Monday. 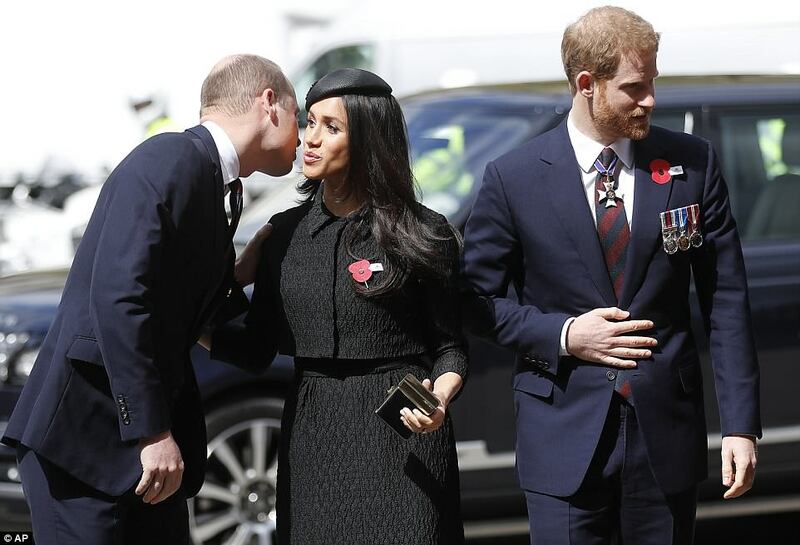 He was pictured warmly greeting his future sister-in-law with a kiss on the cheek and a gentle pat on the back as they arrived, along with Prince Harry, for a service honouring Australia and New Zealand's fallen. As speculation over the new prince's name reaches fever pitch, William was heard joking with Sir Jerry Mateparae, New Zealand High Commissioner to the UK. 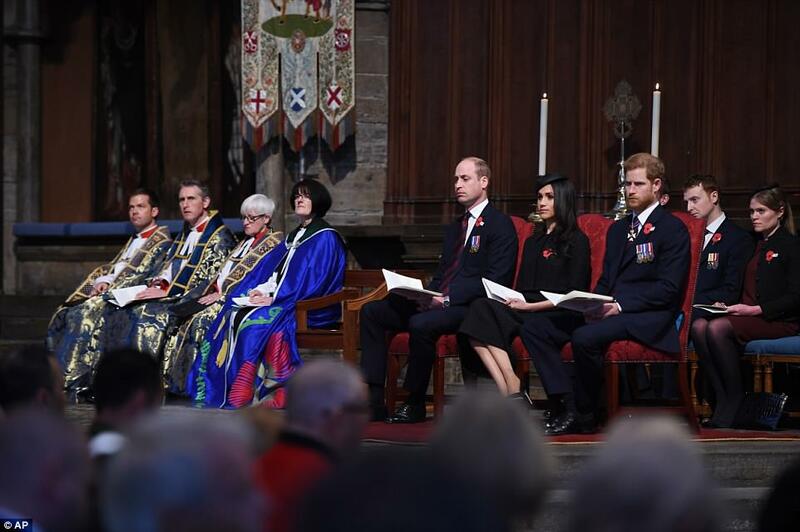 The Dean of Westminster paid tribute to the thousands of soldiers from Australia and New Zealand who paid the ultimate sacrifice in the First World War and subsequent conflicts. 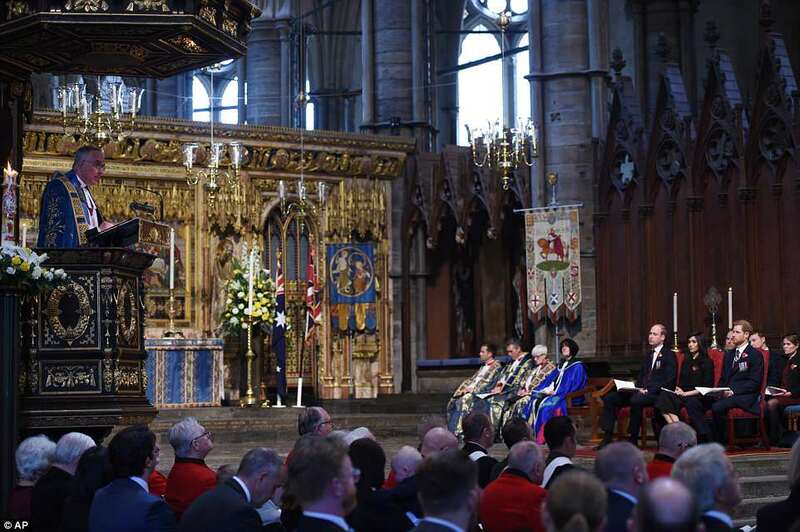 The Very Reverend Dr John Hall, Dean of Westminster, told the congregation in the Abbey: 'The landing of allied forces at Gallipoli on 25th April 1915 led to one of the bloodiest battles of the First World War. 'Australian and New Zealand forces joined together for the first time, and a new word entered the language Anzac. 'Remembering that so many died, we honour the bravery and determination of the men at Gallipoli. The memory of what became known as The Great War is with us as a warning and an encouragement. 'We are warned that war involves suffering and death; we are encouraged by the spirit of national pride shown by the soldiers we remember this Anzac Day. 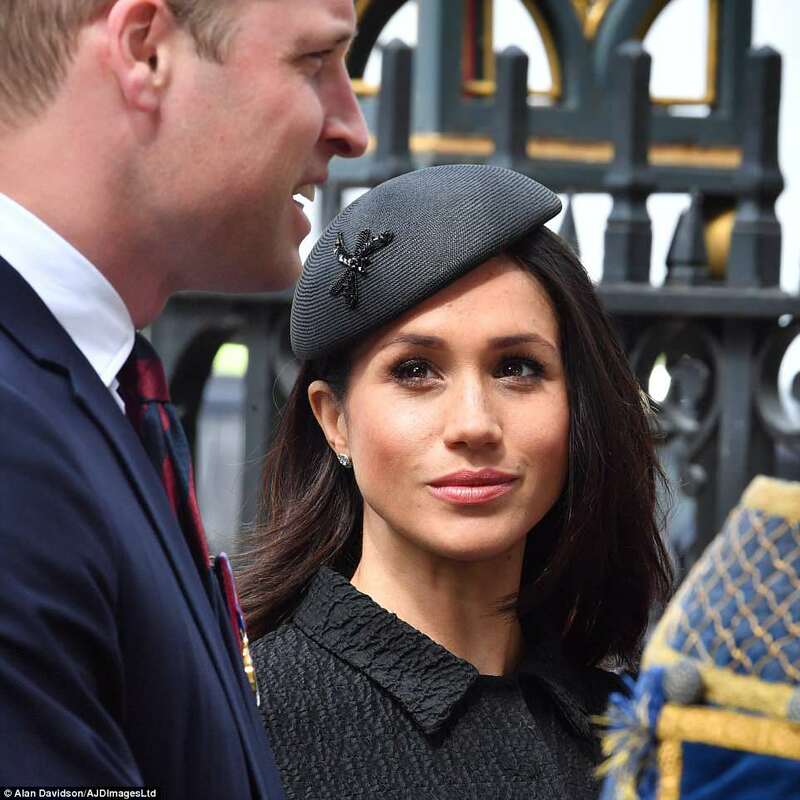 The American passed a cultural milestone when she, and Harry, were welcomed by Te Ataraiti Waretini, a member of the London Maori Club, with a traditional hongi, the soft pressing of noses and the sharing of each other's breath. 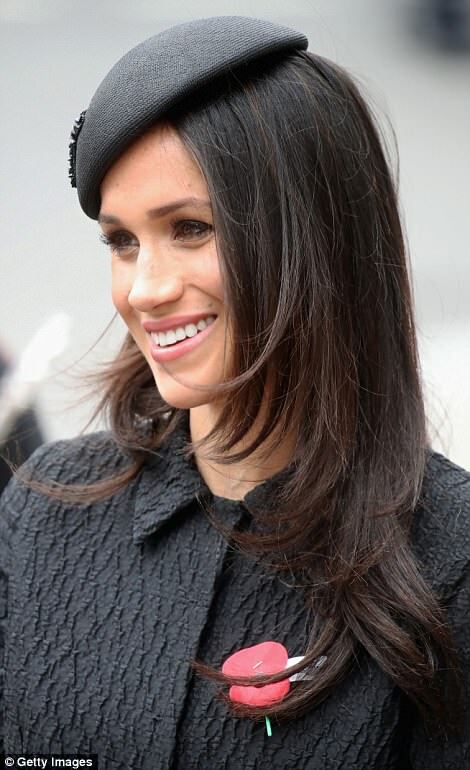 Ms Waretini, a New Zealander living in London, said about Meghan: 'She was amazing. I'm not sure if it's her first time at a Maori ceremony but she did very, very well. Prince Harry previously met Ms Waretini, 31, through her association with the London Maori club, which was invited to New Zealand House to meet with the royal in 2014 as part of preparations for the Invictus Games. As the sun broke over the London skyline, Harry, a former army officer who served for 10 years in the forces, laid his floral wreath at one of a group of metal crosses near Wellington Arch in central London. 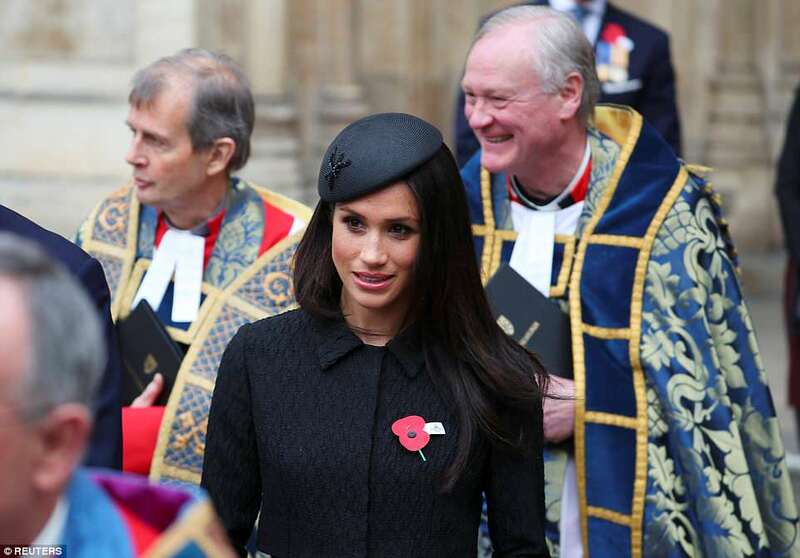 Ms Markle may not yet be a member of the royal family but she has attended a large number of official events in the run-up to her royal wedding on May 19. There were other Maori elements during the dawn service including a haka performed at the end, a longer version of the one displayed by the famous New Zealand rugby team the All Blacks before matches. Trevor Mallard, speaker of the New Zealand House of Representatives, gave the address during the dawn service and told the Kiwis and Aussies: 'Today we remember 100 years have passed since the final year of the First World War. 'We honour the service of those who came half way around the world. During the service prayers were read by young school children and the Last Post was sounded by a bugler before a minute's silence was observed by all. 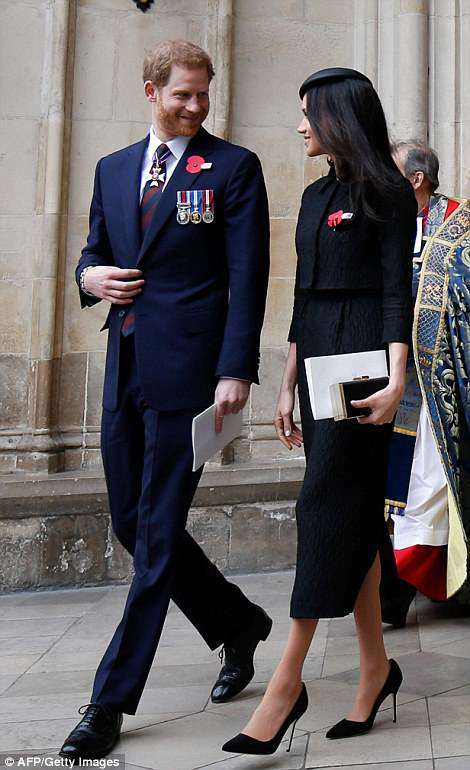 After the service Harry, Meghan and dignitaries walked the short distance to the Australian war memorial where the prince laid another floral tribute. 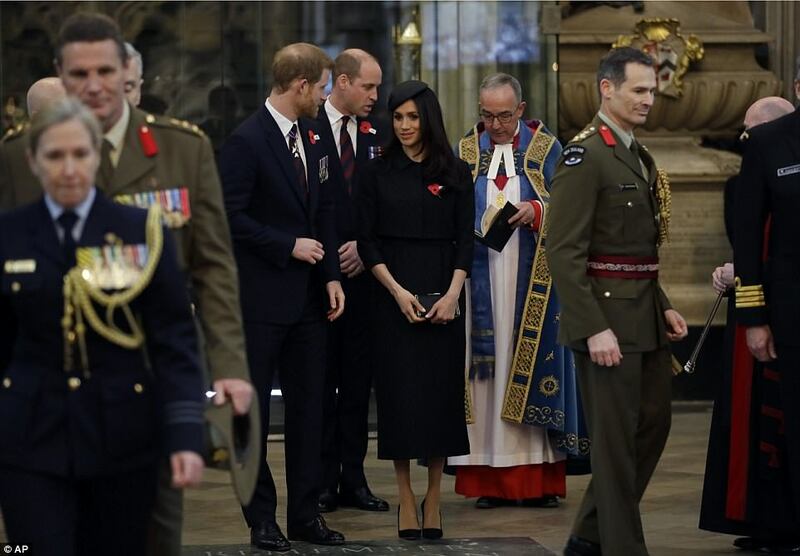 Anzac Day has been commemorated in London since the first anniversary of the Anzac landings at Gallipoli in 1916, when King George V attended a service at Westminster Abbey and more than 2,000 Australian and New Zealand troops marched through the streets. Since then, the services have become an important moment to recognise the Australian and New Zealand Army Corps who died during the landings. Anzac Day is commemorated as a public holiday in both countries with memorial ceremonies held at various locations. The Dawn Service at Hyde Park Corner lasted 45 minutes. 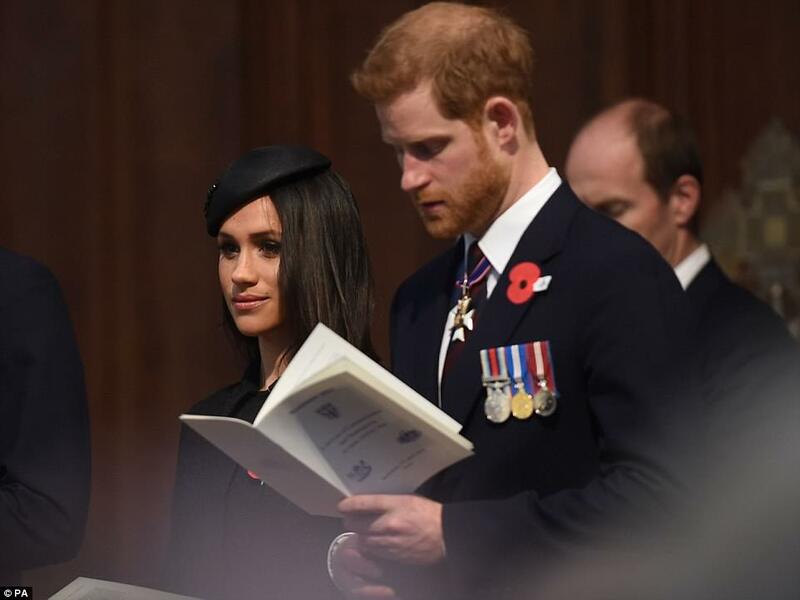 The service began at the New Zealand memorial and included readings, the Last Post, silence, reveille and national anthems, before the couple moved to the granite Australian memorial. 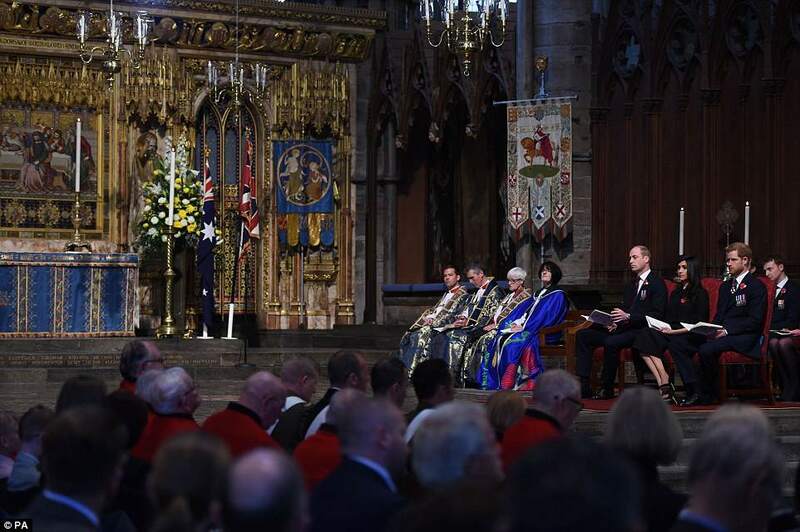 Defence Secretary Gavin Williamson also laid a wreath to mark the wartime service of Britain's close allies Australia and New Zealand. 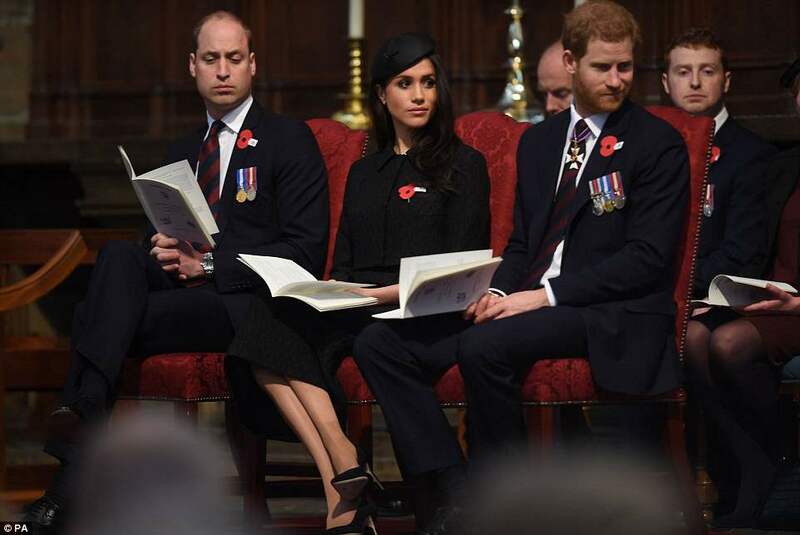 Harry and Meghan were joined by the New Zealand and Australian High Commissioners and both signed a book of remembrance. 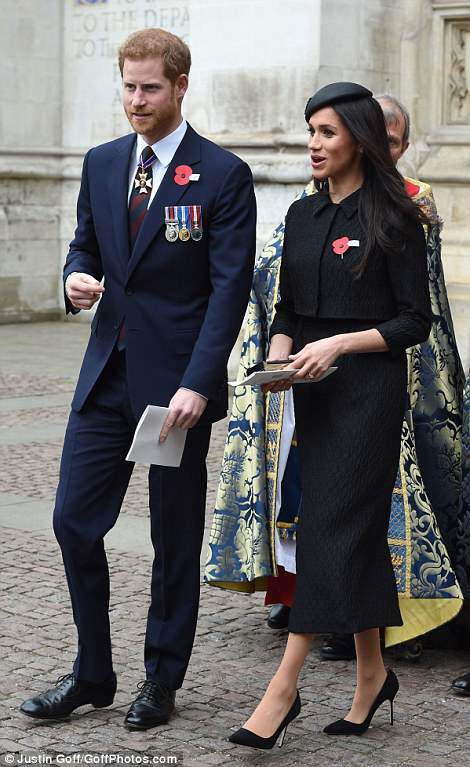 Later in the morning at the Parade Service at the Cenotaph, Prince Harry will lay a wreath on behalf of Her Majesty The Queen. Between 300 and 400 participants will take part in the parade, including member of veterans' associations, service and ex-service personnel and their families. 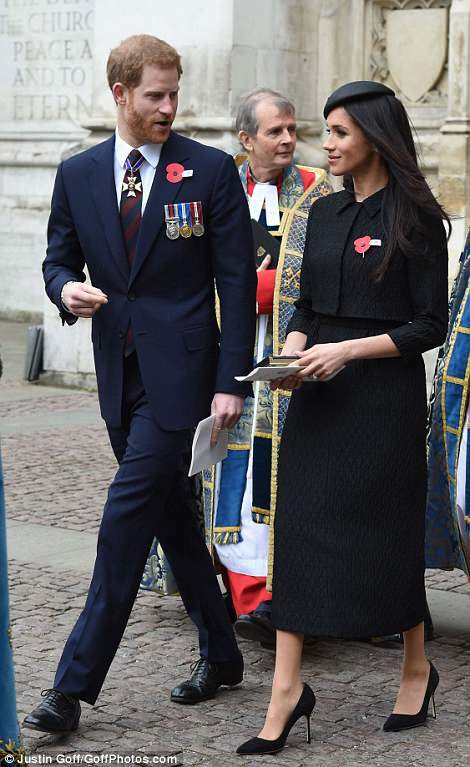 Following this parade, he and Meghan will be joined by new father Prince William at the Service of Commemoration and Thanksgiving at Westminster Abbey. This will be a traditional church service, incorporating an 'Act of Remembrance', the Last Post and Kemal Ataturk's words from Anzac Cove read by the Turkish Ambassador to the UK. Australians gathered at pre-dawn services on Wednesday to commemorate the moment when Australian and New Zealand Army Corps troops waded ashore at the Gallipoli peninsula in Turkey 103 years ago in their first major battle of World War I. Because extremists have targeted annual Anzac Day ceremonies in the past, concrete barriers were placed around the service in downtown Sydney to protect those who gathered at Martin Place. Among those at the head of the parade was 100-year-old Molly Cummings, who is honouring her many family members who have served for Australia. This year, for the first time, women's service groups marched consecutively as part of the By The Left campaign, which aims to raise the profile of female veterans. Prime Minister Malcolm Turnbull, his French counterpart Edouard Philippe and the heir to the British throne, Prince Charles, will mark Anzac Day in France with a service that also commemorates the 100th anniversary of Australian troops taking the town of Villers-Bretonneux from the Germans. Villers-Bretonneux is now home to the main Australian Memorial of the Western Front. At Villers-Bretonneux, Turnbull and Philippe on Tuesday unveiled a memorial plaque at the new Sir John Monash Centre museum which is named after the Australian general responsible for taking the town. Turnbull and his wife, Lucy, also visited the grave of her great uncle Roger Hughes who was killed by a German shell in 1916 five days after arriving on the Western Front as a young military doctor. Turnbull said in an Anzac Day message that Australians remember veterans of every generation who risked their lives for their country. We best honor the Anzacs of 1918 and the First World War by supporting today's service men and women,' Turnbull said on social media. Home Affairs Minister Peter Dutton represents the Australian government at a service at ANZAC Cove at Gallipoli, where the Australian and New Zealand troops landed under British command in an ill-fated attempt to take the Ottoman Empire out of the war. More than 44,000 Allied soldiers were killed at Gallipoli. Turkish casualties were estimated at 250,000. At the Australian War Memorial in the capital Canberra, an estimated crowd of 38,000 - 10 percent of the city's population - gathered in the cool autumn darkness for the dawn service which began with a lone soldier playing a didgeridoo. 'The attendance at this year's dawn service shows the enduring connection so many people have to Anzac Day,' Memorial Director Brendan Nelson said in a statement.